Alright, the weather's getting hotter, the sun's staying out longer, and it's time to go out and have some fun this summer. Um, but you can't go out like that! What do you think you're doing with that hair? LOL, let's get you gorgeous with the Summer Social Giveaway hosted by our Collective Media Magic team Just Like June, Have Sippy Will Travel, Closer To Lucy, 3 Princes and A Princess 2, That's What She Said, and our Special Guest Hostess, Blessed Elements. 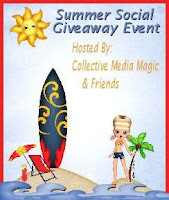 This giveaway will have 4 winners, 1 grand prize winner and 3 runner ups. -A $50 gift card to SwimSpot. I visited Shabby Apple and really liked their Hollywood Hills cocktail dress. Thank you for hosting this giveaway. I love the Frabjous Day dress. I love the Ballerina style! I love the Elizabeth Islands!